Eastleigh boss Chris Todd has said he would like to manage hometown club Swansea City in the future. National League Eastleigh came within minutes of upsetting Championship side Bolton in the FA Cup third round. Todd, 34, in his first managerial role at Eastleigh, started his playing career at Swansea. "I'd love to manage Swansea City one day. That would be very special," Todd told BBC Wales Sport. "I want to be a top-flight manager. I believe I've got the capabilities of doing that. "I'll have to work extremely hard and have a lot of luck along the way. "But you've got to be positive, there's no point doing the job otherwise." Todd began his professional career at Swansea and made 46 appearances before being released in June 2002. 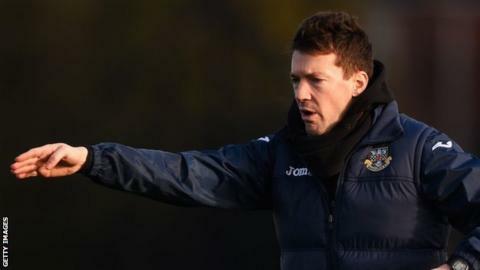 He subsequently played for Exeter City, Torquay United - where he was diagnosed with leukaemia - and Newport County and was appointed Eastleigh manager in October 2015. Todd's Eastleigh - the lowest ranked team left in the FA Cup - led through a Dorian Dervite own goal just after half-time against Bolton. But former Swansea midfielder Darren Pratley spared Bolton's blushes when he equalised three minutes from time to earn a replay at the Macron Stadium on 19 January. "We probably should have got the win but on reflection we are very pleased as a football club to still be in the draw," Todd added. "We put in such a good performance against a lot of good players. "We've got to go there full of confidence. We'll have a right go and see how it plays out."